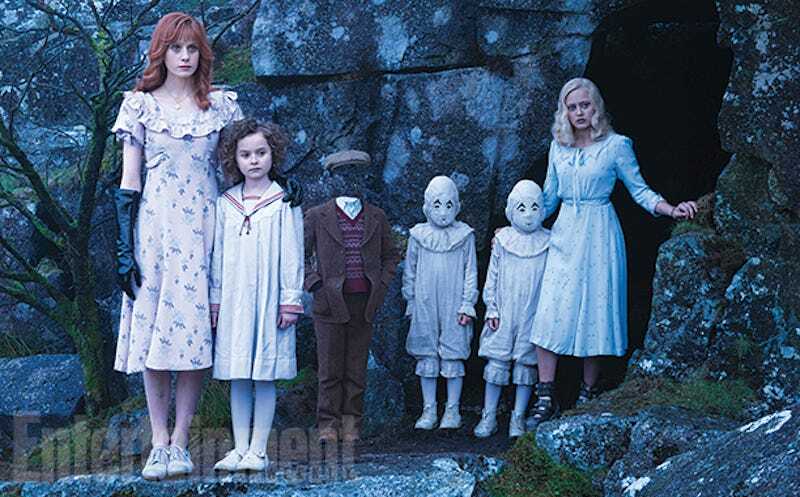 Entertainment Weekly has the first images from Tim Burton’s Miss Peregrine’s Home for Peculiar Children, and they are, as one would expect, completely creepy. From left to right, the characters in this photo are Olive (Lauren McCrostie), Bronwyn (Pixie Davies), Millard (Cameron King), the twins (Thomas and Joseph Odwell), and Emma (Ella Purnell). I think Bronwyn can see into my very soul. Based on the book by Ransom Riggs, Miss Peregrine’s Home for Peculiar Children is the story of Jake (Asa Butterfield) who travels to the mysterious orphanage his grandfather claims to have lived in. The orphanage is run by a shapeshifter (Eva Green as the titular Miss Peregrine) and houses children with special gifts. Oh, it also runs out of sync with time—which is how Jake connects with Emma, who was also close with his grandfather when he was at the orphanage. I’m sure that last bit is going to make the therapist who told Jake to go to the orphanage happy.